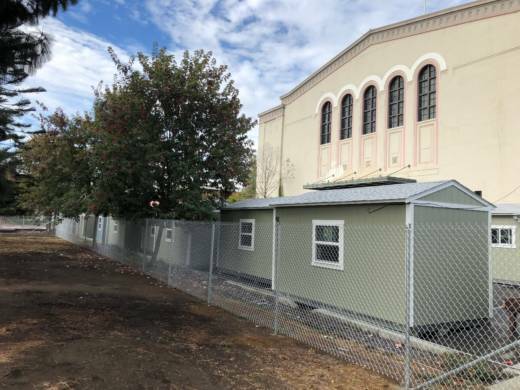 Oakland plans to open its latest temporary homeless housing community made of small sheds on Thursday near Lake Merritt. 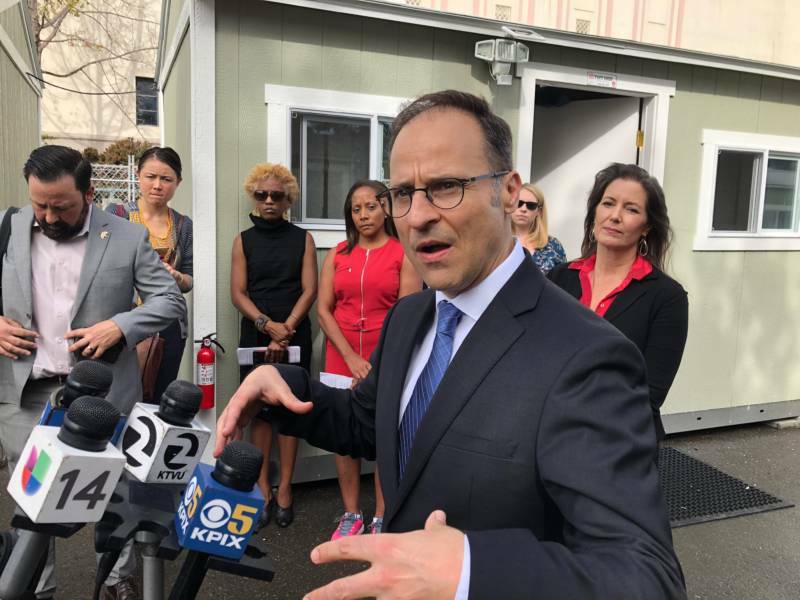 It's the third such "Tuff Shed" camp installed by Oakland authorities since December to help alleviate the city’s rampant homeless problem. Critics of the program say the camps have too many rules, but Oakland Mayor Libby Schaaf says this is a misconception. "The residents of this community can come and go as they please," Schaaf said Tuesday morning during a press conference and walk-through of the project. "The key to their units is held only by them." There are 20 identical pale-green cabins arranged in rows by Lake Merritt poised to house 40 people. Each 136-square-foot plastic shed boasts a door, three windows, a plastic trash can and two camping cots separated by a cloth curtain. The fact that the sheds will house two people has raised some red flags. One homeless man in the Lake Merritt community — who asked not be named because he felt embarrassed about his housing situation — said he believed that asking potential strangers to live together could provoke conflict between residents. Due to the possible presence of mental illness, addiction or behavioral problems — even just chronic snoring or different sleep schedules — he believes the sheds should be single occupancy. Joe DeVries, assistant to the city administrator, acknowledged this potential friction and said the city is "trying to match people as best we can" and "work on the whole person." The new encampment offers 24-hour security, site management and full-time case managements of its occupants. "Living in your car on the street is less safe than living in a secure facility," DeVries said. DeVries also explained that this Thursday is a "soft opening" for people to move into the sheds. There are still a host of things that need to happen, including the addition of green privacy screens to the chain-link fence that encompasses the camp, the completion of the call box and the improvement of the "community tent," which arrived Tuesday. DeVries also emphasized that the city doesn't conceive of these sheds as a permanent solution. "We don't consider this housing. We consider this moving from a tent to a bed," he said. Schaaf said that more than half of those housed at the first enclave at Sixth and Brush streets have permanent housing now. "That is a far higher rate than our traditional mobile outreach that we do on a day-to-day basis throughout the streets of Oakland. So this is a strategy that is worth scaling." Oakland officials said that shortly after the shelter opens, the city will begin enforcing a camping ban around the lake. KQED's Chloe Veltman and Bay City News contributed to this post.